Stringhalt is an abnormal gait that involves exaggerated flexion of one or both hock joints, resulting in a rapid elevation of the hind limb. The abnormality might be subtle--such as minor upward jerking of the hind leg, or so severe that the canon bone and fetlock are pulled violently against the horse's belly. The gait abnormality generally only occurs at the walk and is not present at other gaits. Some horses with stringhalt have difficulty backing. 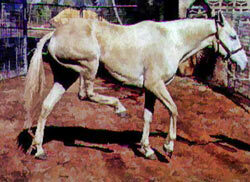 Horses with very mild disease may only demonstrate stringhalt when backing. Stringhalt should be differentiated from upward fixation of the patella, fibrotic myopathy, shivers, and other mechanical causes of lameness. Stringhalt is caused by neuropathy (disease of the nerve) that innervates the hind limb. Although neuropathy is well documented the exact biomechanical cause is still unknown. There is a well established pasture associated stringhalt in Australia involving a flatweed dandelion (Hypochoeris radica). In the United States (US) pasture associated stringhalt is becoming more prevalent. 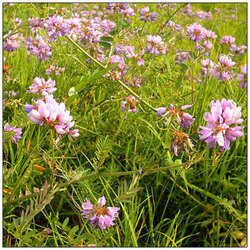 In the US pasture associated stringhalt involves vetch and sweet peas. 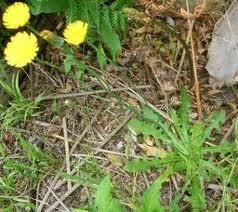 The flatweed dandelion is also making its way to the US, and has been reported in Indiana. In addition to toxic plants, anything that can cause neuropathy can cause stringhalt. Equine protozoal myeloencephalitis (EPM), trauma, tendon adhesions, equine motor neuron disease, and viral encephalitis are other causes. Accurate diagnosis is very important. Treatment involves removing the horse from pasture and resolving the inciting cause. The drug phenytoin has been effective in some cases of stringhalt. Some veterinarians recommend the vitamin thiamine as an adjunct treatment. Because thiamine deficiency is not a known cause of stringhalt, using thiamine as a treatment is of dubious value. Horses that do not respond to medical therapy may respond to surgical removal of the lateral digital extensor tendon. This is the tendon that connects the muscle that causes exaggerated upward flexion when the affected horse walks. Horses affected by stringhalt may return to full athletic performance or may always have an abnormal gait.